You are at:Home»April»April 27»April 27, 33 BC: Lucius Marcius Philippus celebrates a Triumph for his Victories! April 27, 33 BC: Lucius Marcius Philippus celebrates a Triumph for his Victories! On April 27, 33 BC, Roman politician Lucius Marcius Philippus, a step-brother to the future emperor Augustus (r. 27 BC–AD 14), celebrated a triumph for his victories while serving as governor in one of the provinces of Hispania. The Roman triumph was a civil ceremony and religious rite of ancient Rome held to publicly celebrate and sanctify the success of a military commander who had led Roman forces to victory in the service of the state or, originally and traditionally, one who had successfully completed a foreign war. Philippus ascended Rome’s ladder of political and religious offices in a career lasting nearly three decades before his triumph in 33 BC. By 50 BC, Philippus had possibly become an Augur, one of the priests of ancient Rome. In 49 BC, he was elected as Plebeian Tribune, on office that was the most important check on the power of the Roman senate and magistrates. In 44 BC, he was elected praetor, a title granted by the government of Ancient Rome to men acting as either the commander of an army or an elected magistrate. With his father’s marriage to Atia Balba Caesonia (85 BC – 43 BC), Philippus became step-brother to Octavianus, the name at the time of the future emperor Augustus and also Julius Caesar’s heir. 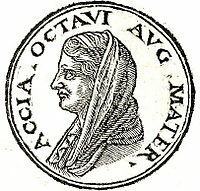 Following the death of Caesar and victory of Octavianus in the ensuing civil war against Caesar’s murderers, Philippus obtained the consulate as one of the suffect consuls of 38 BC. A consul was the highest elected political office of the Roman Republic, and the consulship was considered the highest level of an ascending sequence of public offices to which politicians aspired. If a consul died during his term (not uncommon when consuls were in the forefront of battle) or was removed from office, another would be elected to serve for the remainder of the term as consul suffectus (suffect consul). A consul elected to start the year – called a consul ordinarius (ordinary consul) – held more prestige than a suffect consul, partly because the year would be named for ordinary consuls. By 35 BC, Philippus was appointed the governor of one of the two Roman provinces of Hispania. After serving there for two years, he returned to the city of Rome, where he was awarded the aforementioned triumph for his actions while governor. With the spoils of his victories, he restored the temple of Hercules and the Muses in the Circus Flaminius, a large, circular area in ancient Rome that contained a small race-track used for obscure games and various other buildings and monuments. What would you do if you won any substantial amount of money? Would you spend your winnings on yourself or give back to the community as Philippus did over two thousand years ago? Beard, Mary. The Roman Triumph. Belknap Press, 2009. Previous ArticleApril 26, 1336: Petrarch ascends Mont Ventoux!